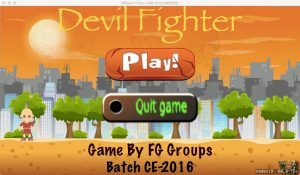 HOW DEVIL FIGHTER GAME WORKS.? This is a Simple Game where you have to kill the Dead and Zombies Coming at you by tapping on your iPhone Screen or on the Fire button it selfs. and if the Zombies or The Dead Character Touches you then the game will be over , we are going to add multiple levels in it so if you Reach the score to Score >=70 then you will be redirect to another level of this game. where the quantity of the Villains will increase and they will become difficult to kill with time to time.We will Update the Devil Fighter Game. Well its our First Game so Will Are try to Place the Payment as minmum as we can So it will be around 1.99$ to 0.99$ it will be decided within the Meeting that we will have between us developer’s Friends. The Realizing date of Devil Fighter is going Be Mid- of – November,2017 With the first Release on Apple Store OR you can say the App Store of Apple For IOS Devices .